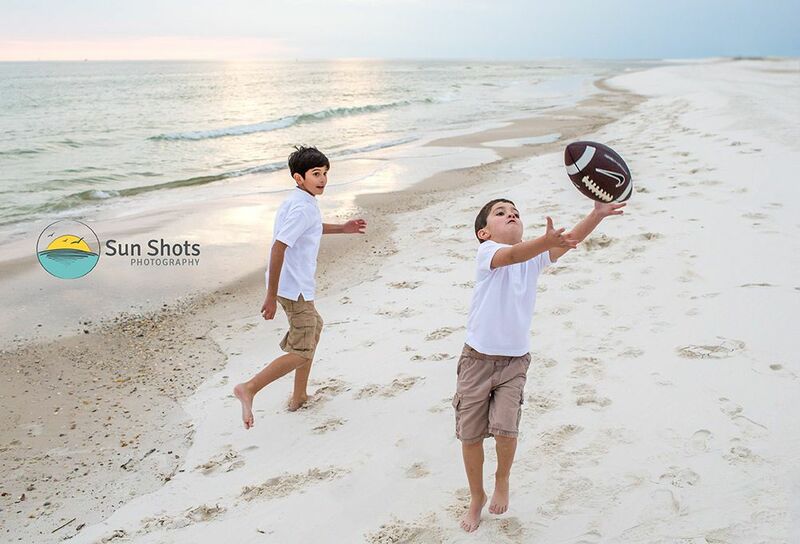 We started the new year off right yesterday afternoon with a Gulf Shores family beach reunion photography session. The weather was perfect and the beach was completely empty, outside of a few snowbirds, lol. Everyone had a grand time, and we even managed to squeeze in a little football game at the end of the session. I think grandfather had more fun than the kids. The whole session was fun and enjoyable for all. We really had a great time with this group. Winter sessions like this one are why I love the Gulf Coast. Our mild winters can be a perfect backdrop for your family reunion. Nothing like a break from freezing temperatures back home. While your friends are back home waist deep in the snow, you are on a winter vacation working on your tan. This time of year, the price to rent a condo or house is also super budget friendly, and you pretty much have the whole town to yourselves. No waiting in lines at the fried shrimp place, and most of the time the go-cart guys will let you get a few extra laps in, I mean win-win, right? So what are you waiting for, book your winter vacation now before the weather warms up back home... See you when you get here!